When did Christians stop being kind? Kindness is not what we have been taught it is. It isn't a soft virtue, expressed only by sweet grandmothers or nice Boy Scouts. Kindness is neither timid nor frail. Instead, it is brave and daring, willing to be vulnerable with those with whom we disagree. It is the revolutionary way that Jesus himself called us to live. The way of selfless risks. The way of staggering hope. The way of authenticity. 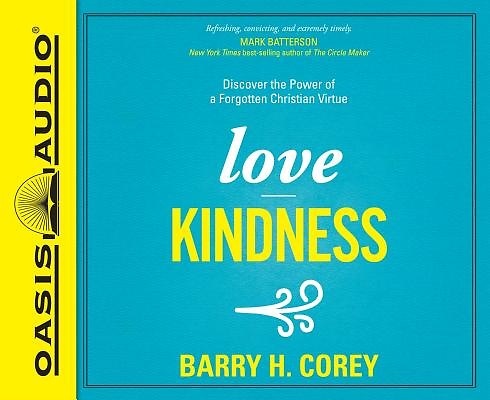 Dr. Barry Corey, president of Biola University, believes we tend to devalue the importance of kindness, opting instead for caustic expressions of certainty that push people away. We forget that the essence of what God requires of us is to "love kindness." In this book, filled with stories from his travels around the globe, Barry shows us the forgotten way of kindness. It is a life that calls us to put ourselves at risk. A life that calls us to hope. A life of a firm center and soft edges. It is the life Christ invites us to follow, no matter what the cost.